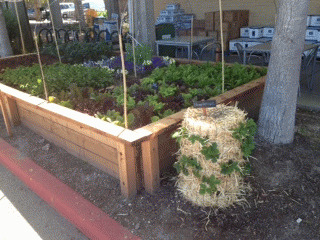 MONTEREY WHOLE FOODS GROWING FOOD IN ITS PARKING LOT? Amid the petrol-gasses Whole Foods grows edible flowers and herbs for its organic kitchen. Whole Foods the produce store that has become the American icon for pure food in front of its Monterey, Monterey County, California branch situated in the veritable cornucopia of the United States, put a garden for edibles in its parking lot. When the maintenance man for the store was building the grow box, a big UPS truck was parked at its side panting carbon monoxide in clouds over the proposed site for Whole Foods produce grow box, and this brought up serious questions. Whole Foods, following Alice Waters owner of Chez Panisse, a Berkeley, California restaurant famous for its home grown vegetables. In fact, she is so well recognized for this and using it to reach out to children to develop an interest in vegetables that the Obama White House used her model for the same on the President's residence grounds and kitchen use. Whole Foods is the only program known to develop a growing box with leafy vegetables in a air polluted parking lot. It was curious there was no publicity about this, and inquiring with the city of Monterey if there was a permit to grow food by a produce store issued or even applied for took us to the County Health Department. The responsibility described by our official Mr. Roger Baretti by the county in California oversees basic sanitation such as, hand washing in public service establishments, the freshness of food sold, cleanliness of kitchens and facilities open to the public. Never has there been a garden in public that may offer food grown there, for sale. Checking with his superiors, because there had never been a question like this before, they came up with the little researched regulations that food gardens aren't supposed to be accessable to the public. Trucks or cars shouldn't be allowed to be idling within two feet of the garden; and other precautions should be taken to prevent bacterial danger. Some of those dangers to the public with regard to food production and storage for the safety of microbial contamination and of or about culinary gardens include protection from animals, pets that walk by, birds that poop from overhead, people who could spit into the box while walking past, flipped cigarette buts. Monterey store manager Kelli Takikawa didn't know about the regulations either. She was following a program initiated by Whole Foods all over the country. It is part of a children's' awareness program all about leafy vegetables' growth and development, as instigated by our nation's First Lady, Michelle Obama. After all, general manager Takikawa said "In the fields they grow commercial vegetables right next to the highway, don't they?" We did have a great scandal in the California produce world with an organic juice company, Odwalla where it was discovered an ecoli outbreak was traced to a nearby field where animals were found to be grazing too close. The trucks parked right next to the grow box in the Monterey Whole Foods parking lot. How much did the hydrocarbons pollute the air and effect the leafy vegetables, too? This question took our inquiring minds to the oracle of the produce industry in California, University of California at Davis. After only three transfers we spoke to the Farm Advisor, Richard Smith (rifsmith|AT|ucarir.edu Email address">rifsmith|AT|ucarir.eduEmail address) in Monterey County, who admitted it seemed awful, but there has been no research regarding the effect of hydrocarbon air pollution on leafy vegetables. And, our biologist said it seemed to her the rich nitrogen in the air would be healthy for the leafy vegetables. There are many varieties as you will learn at the Whole Foods with the grow box. Whole Foods global officer Beth Krauss was reached at her office in Texas, and she assured us that all appropriate research and permissions were known before the program began, but admitted she did not know some things. The question applicable to Monterey specifically about them not having a permission mechanism for commercial service of on site grown food being served was suspected as political. Because, after all Monterey is the veritable cornucopia where home grown food might compete with the 'everything under the sun' produce grown and sold in this region's world famous industry.